Swagger is now the defacto standard for documenting REST APIs - it's widely used, known and adopted. 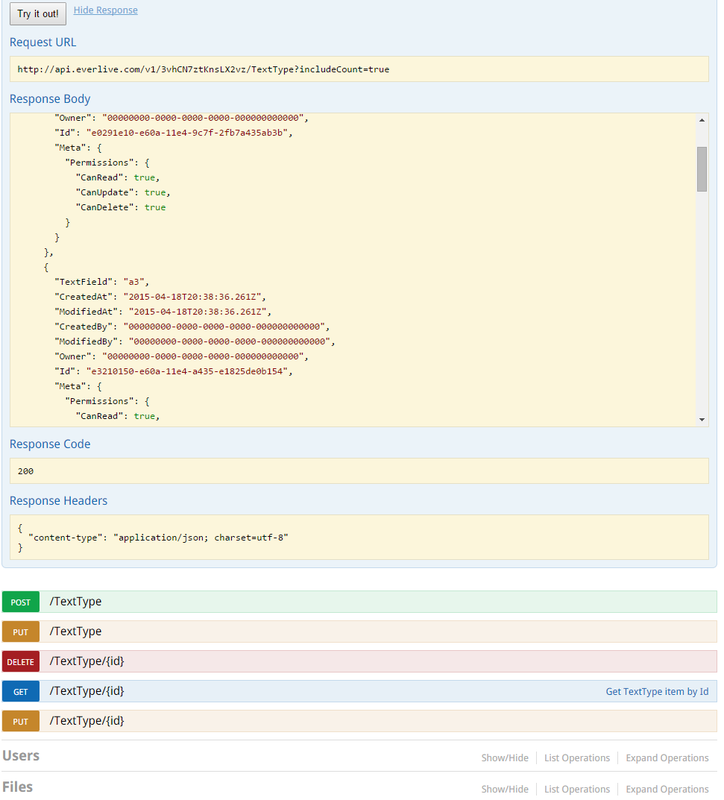 In most cases, you add comments and meta information to your APIs in your own code, and swagger can generate an API reference for it. It's not a static one though, not only you can see the definitions, parameters and etc. but you can even give it a try, which is awesome. If you're using the Telerik Backend Services (a.k.a. Everlive) you may find this little project quite useful. By entering your API Key and Master Key it dynamically generates a Swagger API definition for your Content Types in Everlive. Therefore, you can easily test out stuff - add items, query items, check boundary cases like errors and etc - the best part is that you can do this without writing a single line of code. The project generates dynamically a Swagger definition for an Application in the Telerik Backend Services. By providing your API and Master Keys the service extracts your Application's Metadata and generates a Swagger Definition with all your Content Types and Fields. The auto-generated content is then displayed in the nice Swagger UI.